Many homes have a prayer room or altar. In Hindu households, a lamp is lit and the Lord worshipped each day. Other spiritual practices like japa (repetition of the Lord’s name), meditation, paaraayana (reading of the scriptures), prayers, Bhajan/devotional singing, etc., is also done here. Special worship is done on auspicious occasions such as birthdays of loved ones – both human and the Gods, anniversaries, and festivals, but each member of the family, young or old, communes with and worships the Divine here. Since the Lord is considered the creator, He is therefore the true owner of the house we live in too. We are mere earthly occupants of His property, thus this notion rids us of false pride and possessiveness. Since the Lord is all-pervading, and to remind us that He resides in our homes with us, we have prayer rooms. Each room in a house is dedicated to a specific function like the bedroom for resting, the living room to receive guests, the kitchen for cooking etc. The furniture, decor and the atmosphere of each room are made conducive to the purpose it serves. So too a conducive atmosphere is required for the purpose of meditation, worship and prayer, thus the need for a prayer room. Why do we do namasté? Indians greet each other with namasté (na-mas-té). The two palms are placed together in front of the chest and the head bows whilst saying the word namasté. This greeting is for all people younger than us, of our own age, those older than us, friends and even strangers. There are five forms of formal traditional greeting enjoined in the shaastras of which namaskaram is one. This is understood as prostration but it actually refers to paying homage as we do today when we greet each other with a namasté. Namasté could be just a casual or formal greeting, a cultural convention or an act of worship. However there is much more to it than meets the eye. In Sanskrit namah + te = namasté. It means I bow to you my greetings, salutations or prostration to you. Namaha can also be literally interpreted as “na ma” (not mine). It has a spiritual significance of negating or reducing one’s ego in the presence of another. The real meeting between people is the meeting of their minds. When we greet another, we do so with namasté, which means, “may our minds meet,” indicated by the folded palms placed before the chest. The bowing down of the head is a gracious form of extending friendship in love and humility. The spiritual meaning is even deeper. The life force, the divinity, the Self or the Lord in me is the same in all. Recognising this oneness with the meeting of the palms, we salute with head bowed the Divinity in the person we meet. That is why sometimes, we close our eyes as we do namasté to a revered person or the Lord as if to look within. 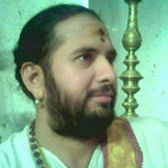 The gesture is often accompanied by words like “Ram Ram”, “Jai Shri Krishna”, “Namo Narayana”, “Jai Siya Ram”, “Om Shanti” etc indicating the recognition of this divinity. Why Hinds put Tilak / tika on forehead ? Usually, the Tilak is applied on the forehead between the eyebrows. This spot is known as Aagna Chakra and is considered to be the seat of memory and thinking. It is also said that the chandan or bhasma cools the forehead and the spot between the eyebrows, which is known to generate heat during stress and tension. It is also known to prevent energy loss. What is the purpose of a shikhã (choti) ? where there is a nexus of all nerves, and a joint (Sushrut Samhitã 6/71). The shikhã protects this spot. body. In Yog, Brahmarandhra is the highest, seventh chakra, with the thousand-petalled lotus. It is the centre of wisdom. The knotted shikhã helps boost this centre and conserve its subtle energy known as ojas. Why do we hold fasting on special days ? A lot of our time and energy is spent in procuring food items, preparing, cooking, eating and digesting food. Certain food types make our minds dull and agitated. Hence on certain days man decides to save time and conserve his energy by eating either simple, light food or totally abstaining from eating so that his mind becomes alert and pure. The mind, otherwise pre-occupied by the thought of food, now entertains noble thoughts and stays with the Lord. Since it is a self-imposed form of discipline it is usually adhered to with joy. Also every system needs a break and an overhaul to work at its best. Rest and a change of diet during fasting is very good for the digestive system and the entire body. The more you indulge the senses, the more they make their demands. Fasting helps us to cultivate control over our senses, sublimate our desires and guide our minds to be poised and at peace. Fasting should not make us weak, irritable or create an urge to indulge later. This happens when there is no noble goal behind fasting. The Bhagavad Gita urges us to eat appropriately – neither too less nor too much – yukta-aahaara, and to eat simple, pure and healthy food (a saatvik diet) even when not fasting. Why are incense sticks burnt during pujã rituals? These substances possess certain properties which purify the air and induce good or positive vibrations in the brain. This helps a person concentrate more easily during meditation or a pujã ritual. A philosophical moral of the burning incense stick is that, just as it burns away to ashes while simultaneously pervading the air with fragrance, an aspirant should sacrifice his life to serve others and mould it such that its fragrance inspires others. Is it to wake up the Lord? But the Lord never sleeps. Is it to let the Lord know we have come? He does not need to be told, as He is all-knowing. Is it a form of seeking permission to enter His precinct? It is a homecoming and therefore entry needs no permission. The Lord welcomes us at all times. Then why do we ring the bell? Indians prostrate before their parents, elders, teachers and noble souls by touching their feet. The elder in turn blesses us by placing his or her hand on or over our heads. Prostration is done daily, when we meet elders and particularly on important occasions like the beginning of a new task, birthdays, festivals etc. In certain traditional circles, prostration is accompanied by abhivaadana which serves to introduce one-self, announce one’s family and social stature. Man stands on his feet. Touching the feet in prostration is a sign of respect for the age, maturity, nobility and divinity that our elders personify. It symbolizes our recognition of their selfless love for us and the sacrifices that they have done for our welfare. It is a way of humbly acknowledging the greatness of another. This tradition reflects the strong family ties which has been one of India’s enduring strengths. The good wishes (Sankalpa) and blessings (aashirvaada) of elders are highly valued in Indi. We prostrate to seek them. Good thoughts create positive vibrations. Good wishes springing from a heart full of love, divinity and nobility have a tremendous strength. When we prostrate with humility and respect, we invoke the good wishes and blessings of elders which flow in the form of positive energy to envelop us. This is why the posture assumed whether it is in the standing or prone position, enables the entire body to receive the energy thus received. The different forms of showing respect are Pratuthana rising to welcome a person. Namaskaara paying homage in the form of namasté (see above). Upasangrahan touching the feet of elders or teachers. Shaashtaanga prostrating fully with the feet, knees, stomach, chest, forehead and arms touching the ground in front of the elder.